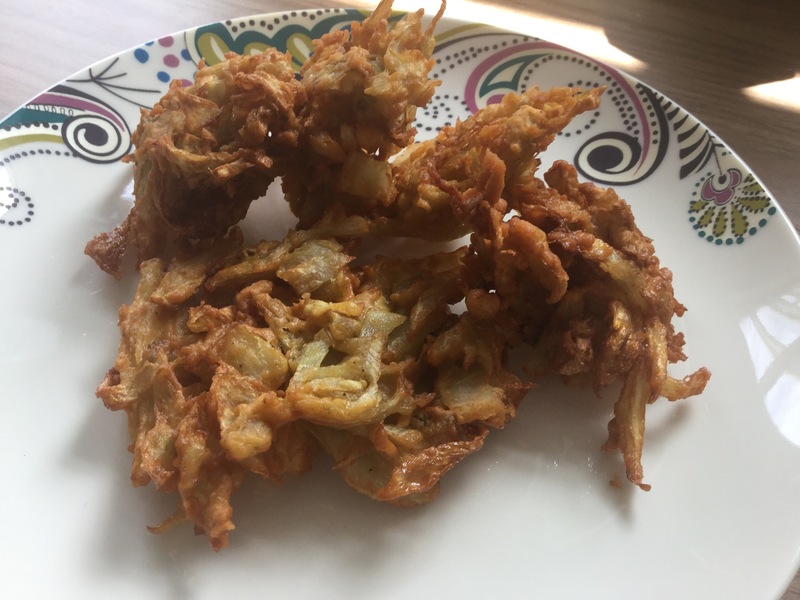 Back in the dawn of time (well probably only 3 years ago) the onion bhaji was a go to happy snack for me, however between gluten intolerance and onions giving me bad acid reflux they are now firmly off the menu. I was lamenting this with Ellie the other day, and we both came up with the same solution, Fennel! Finely sliced it looks and behaves a lot like onion, and the wonderful anise flavours make this a great alternative, a dish of its own, rather than a substitute. I lightly steamed the fennel to mellow the flavour slightly and it gives a better texture for the bhaji. I’m also using a deep fryer, these would work in a regular skillet with a good covering of oil too. Remove the green parts of the fennel bulb ( I used them in soup) and finely slice the bulb into thin strips. Place in a microwave bowl with 2 tablespoons water, cover and microwave for 90 seconds. Don’t drain the water! Add the spices, salt and pepper to the fennel and steaming water, mix, then add the gram flour. This will create a sticky batter that will just hold the fennel together. When the oil is up to temperature carefully place desert spoon sized dollops into the oil. When they float up to the surface, carefully turn over with a slotted spoon. Cook until the bhaji are well browned and crispy, about 5 minutes.